Below is a list of frequently asked questions. If you can't find the answer to your question, contact us at info@mycameracouture.com. Where are the straps made? Can I wash my camera strap? Has the product been discontinued? Can I copy your photos or graphics? I personally hand make all the straps right here in my home, located in the Vancouver area in British Columbia, Canada.� I have a studio where I share space with my scrapbooking supplies, my beading, my knitting, and my sewing machine.� My house is smoke free. Yes, I do custom orders. Refer to my "Custom Order" page for more details. Yes, but the order is then considered a custom order; pricing varies according to the size and complexity. If you would like a quote, email me the details and I'll reply with a no obligation quote. Adding embroidery is considered a custom design and increases the cost of the strap. Since I don't have my own embroidery machine, I outsource the embroidery to an embroidery shop. Most shops charge a minimum of $15 - 20 to digitize and prepare the job. Contact me with details if you're interested and I'll obtain a no obligation quote for you. Note: if you have an embroidery machine or access to one, you could also prepare your own patch and mail it to me to be sewn directly on your strap during assembly. If you're interested in this option, please contact me first so we can discuss your idea and make sure the design will fit on the strap. Shipping and Handling to Canada and the United States for up to two straps is FREE! Yup, you heard me, FREE. International shipping starts at $10.00. We will send you an e-mail message (via Paypal) when your order has actually been shipped. Product availability is updated regularly, but sometimes we will be out of stock on an item for a short while. We will let you know by e-mail if the product you ordered cannot be shipped promptly. American orders are shipped Canada Post Light Packet unless otherwise specified in the shopping cart (express options are also available). American customers are responsible for any customs fees and taxes. Please allow 6 - 10 days for your shipment to arrive. Orders going outside North America are shipped Canada Post Small Packet (which is insured up to $100.00 CAD) and customers are responsible for any customs fees or taxes. Please allow 10 - 20 days for your shipment to arrive. All prices listed on our web site are quoted in US dollars. Your credit card company will adjust the amount you are charged according to the prevailing currency exchange rate. I will accept returns within 7 days of receiving.� Items must be unused and in original condition and will be sent back at your expense.� A full refund will be issued�upon receipt. 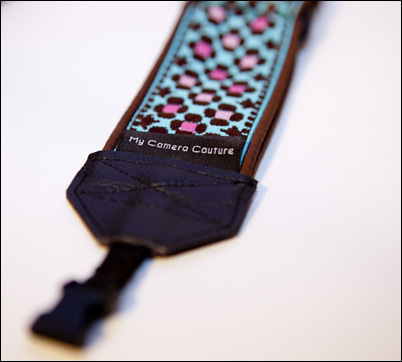 My Camera Couture will work closely with you on any order not delivered to find a solution. PayPal also offers protection to the buyer for non-delivery in case resolution can't be reached with My Camera Couture. If a product you like is shown online and shows as out of stock, it is in the process of being manufactured. This can take days (if the materials are on hand) or weeks (if materials have to be re-ordered). The store doesn't offer a way to post estimated re-stocking dates so please feel free to send an email to Julia at info@mycameracouture.com asking when it will be available. Note that any products not listed in store are discontinued. Discontinued products are removed from the site and not listed as "out of stock". So, if you see the product on the site, it is NOT discontinued. PayPal has purchase protection polices in place to protect both buyers and sellers. When you purchase goods online with PayPal, your transactions are covered. Visit the PayPal website for more details. https://www.paypal.com/ Click on the link at the top of the page "Security Center". Since we are continuously updating our product line, we do not offer a printed catalog. Everything we carry is available on our site. Images and content on this site are protected by Canadian Copyright Laws. All content and most photos, unless otherwise specified, are copyright (c) My Camera Couture 2011. All rights reserved. You shall not copy, distribute, sell, modify images without prior permission from My Camera Couture. Contact us at info@mycameracouture.com to request permission or ask questions.